Driving by on I64/40 it’s obvious that there’s a lot of activity going on at the The City Foundry, job site. S.M. Wilson, the general contractor on the project, has made it possible to scope out the progress that’s being made. 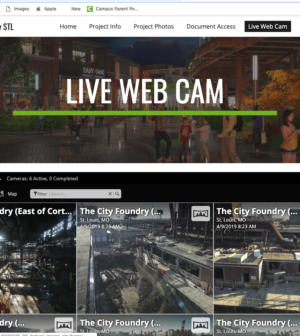 Click here to access the feeds from the six cameras. The former 10-acre century electric foundry complex will transform into which is a space that will have a food hall featuring all local chefs, a dine-in movie theater, beer gardens and several retail stores. The Lawrence Group, developer of the project, is keeping and repurposing the industrial elements of the complex to create an edgy urban vibe. The concrete base for the foundry’s kiln, for example, will become a bar and counter. The Chouteau Greenway — a biking/hiking/running trail connecting Forest Park with the Arch —will flow through City Foundry, utilizing an abandoned railway trestle. At the turn of the 20th Century, St. Louis was a major center for electrical manufacturing Century Electric carried on that local tradition by selling custom hand built motors beginning in 1900. The demand for their motors — used to help fuel the growing demand for electric appliances — expanded rapidly. To facilitate ever increasing product orders, plans were drawn in the late 1920s for a dedicated foundry on The City Foundry site at Spring and Forest Park Avenue. Century Foundry became one of the largest job-shop operations in the Midwest, specializing in custom made parts. The foundry complex was recently added to the National Register of Historic Places for its significance to local Industry.